In what could be a nice game changer, it looks like the PlayStation Network is going to be offering renting soon. 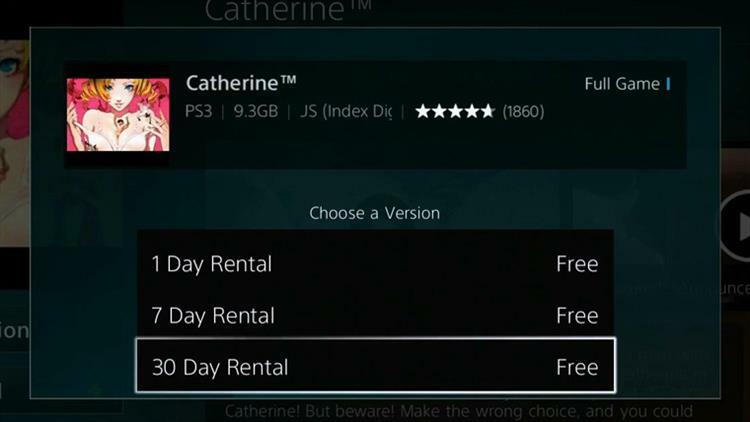 Spotted by someone browsing the PlayStation store, there's a screen cap of the game Catherine with options to rent it 1 day, 10 days, or 30 days. Right now, all of them said free because it's not implemented yet, but it looks like the infrastructure's getting into place. This would be a very nice addition to the PlayStation Store letting folks try games for a limited amount of time. I know there are a few games I'd love to have rented over buying. Also, this should make it more convenient for some than having them go to a kiosk like Redbox to grab a game to play. Now the key is the pricing structure, of course, and if you do get a reduced cost on the total say after you rent it and want to buy the game outright.